There are quite a few cheap Night Vision Scopes on the market. These lower priced night vision scopes are typically Gen 1 and digital technology. The big problem with many of these inexpensive scopes is that the recoil from most rifles including small caliber ones will often knock your zero off. 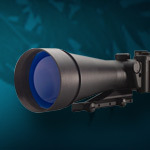 This can be one of the most frustrating things that can happen to a shooter and many a scope and rifle have been thrown on the ground (and kicked) after hours of sighting in to get it perfect, only to have the night vision scope's zero "jump" on your next shot. This is why our selection of cheap Gen 1 night vision scopes is limited to the models below. They are all made to last.